This photo of Comet ISON was taken with the TRAPPIST national telescope at ESO's La Silla Observatory on Nov. 15, 2013. SAN FRANCISCO — If your death-from-above musings focus solely on asteroids, you need to broaden your worried mind. Comets can also deliver a heaping helping of calamity to Earth, and scientists and policymakers alike should start taking measures to combat the threat, said Joseph Nuth, a researcher at NASA's Goddard Space Flight Center in Greenbelt, Maryland. The main reason for this lack of attention is the perception that not much can be done about an incoming comet, because of the difficulties involved in spotting and tracking these icy bodies, Nuth said. But something can indeed be done, if we're sufficiently prepared, he stressed. The fixation on asteroids is understandable. For starters, they're far more common in near-Earth space than comets are, and therefore make up the vast majority of impactors. "A comet comes out of nowhere, pretty much," Nuth said during a scientific talk at AGU on Monday, a few hours before the news conference. 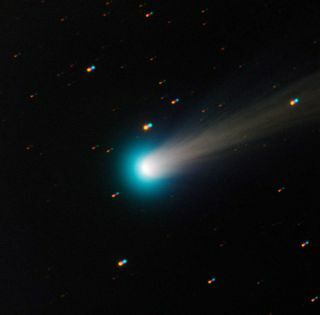 So the element of surprise is more in play with comets than it is with NEAs (the biggest, most dangerous of which have nearly all been found already, scientists say). And that's a problem for deflection efforts, which would launch a spacecraft out to meet an incoming impactor (and then nudge, knock or blast it off course). "If you look at the schedule for producing high-reliability spacecraft, and launching them, it takes five years to launch a spacecraft," Nuth said during the AGU news conference. Whereas the average NEA that hits Earth does so at about 44,700 mph (71,940 km/h), it's not uncommon for comets to hurtle by planets more than twice as fast, Nuth said. In October 2014, for instance, Comet Siding Spring zoomed past Mars at about 125,000 mph (200,000 km/h). So, while comet strikes on Earth are relatively rare — much rarer than asteroid impacts, anyway — they can be potentially cataclysmic, Nuth said. That's why he's sounding the alarm. Nuth thinks the world should start gearing up for a potential comet strike now, or in the very near future at least, because leaving things until the last minute may make deflection efforts impossible. "It's really imperative that we reduce that reaction time," he said during the news conference, referring to the typical five-year lag between mission approval and launch. Nuth's plan calls for building two spacecraft — an "interceptor" and an "observer" — and storing them until they're needed. If a potentially dangerous comet appears in the sky, the observer would be launched to study the object and help astronomers figure out its orbital path, and thereby assess the threat it poses to Earth. If this threat is deemed serious enough, the interceptor would be launched to deflect the comet. This strategy would not necessarily be comet-specific, he added; it could also be used to mitigate a big and dangerous asteroid that managed to slip through astronomers' surveillance. To make all this happen, NASA would have to make a request to Congress. "We're talking a considerable amount of money," Nuth said. "The NASA request would probably be for several hundred million dollars to produce one of these spacecraft." Such a request is not on the books, Nuth said. "I'm a NASA scientist," he said. "I'm not a NASA policymaker; I'm not even in the adminstration of NASA. So this is more a scientific recommendation." It may also be possible to deflect an incoming comet without launching a spacecraft out to meet it. For example, powerful laser blasts could vaporize portions of a hazardous comet's surface from afar, causing the eruption of gaseous jets that would push the icy wanderer off its original trajectory, another study presented at AGU on Monday suggests. "These effects have been observed by heating by the sun alone," lead author Qicheng Zhang, a physics undergraduate at the University of California, Santa Barbara, told Space.com. "A sufficiently large [laser] array can deflect any comet," Zhang and his team wrote in their study. The array could also theoretically help de-orbit space junk and perform a variety of other tasks, Zhang said. "This laser system is very multipurpose," he said.